Quite an event, this, the first ever Hitchcock film to get a Masters of Cinema Blu-ray makeover, and one with one of Hitch's most inventive cameos – appearing as he does as the man in a newspaper ad for weight reduction (he apparently wanted to play a corpse floating by the lifeboat, but apparently this was frowned upon by those in studio power). With a cast including Shadow of a Doubt veteran Hume Cronyn and the extraordinary, irrepressible Tallulah Bankhead, this "picture of characters", as François Truffaut aptly termed the film, oscillates between comic repartée and white-knuckle suspense – a perfect example of "the Hitchcock touch". 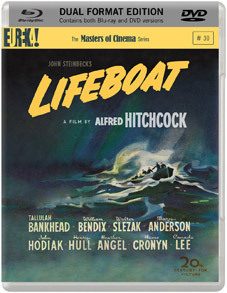 Lifeboat will be released as a dual format package (containing both DVD and Blu-ray versions of the film) on 23rd April by Masters of Cinema at the RRP of £20.42, or £30.63 if you want the Steelbook Edition. 36-page booklet featuring archival imagery alongside new writing by critics Bill Krohn, Arthur Mas, and Martial Pisani.